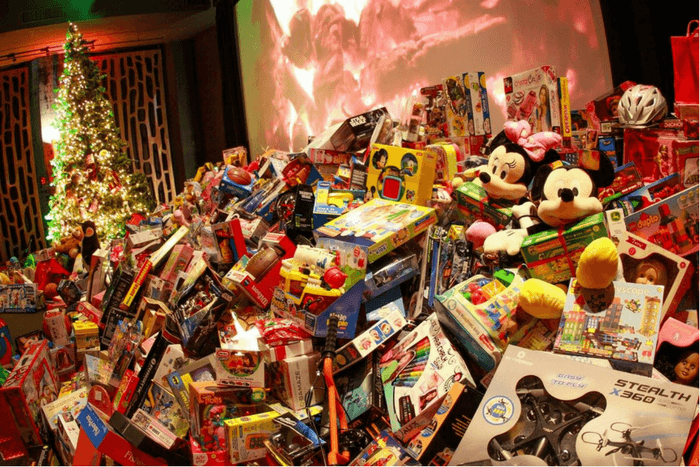 Big Foot Moving & Storage, Inc. is excited to continue our support of Toys for Joys, Inc. We are providing collection boxes, transportation, and storage services for the thousands of new toys that will be distributed to children this holiday season. Toys for Joys does an incredible job bringing feelings of family, hope, and love by providing new toys to children who have very little. A toy, a simple gift, can bring a smile to a child and make the holidays enjoyable. The Toys4Joys Gift Gala will be held at The Revere Hotel’s-Space57 on Friday, December 8, 2017. To find out more about this premier Boston gift drive, visit the Toys for Joys event registration page. For additional info on Toys for Joys and sponsorship opportunities, please email Dr. James Rifino, Founder & President. This is my eigth year participating in this fundraiser as part of the Pie It Forward team. Thanks to many of you, I was one of the top 5 sellers last year. Please consider purchasing a Thanksgiving pie ($30) in support of Community Servings. You can visit my personal donation page for more information and to place an order. You can also download more information about Pie In The Sky. You can also download information about Community Servings here. 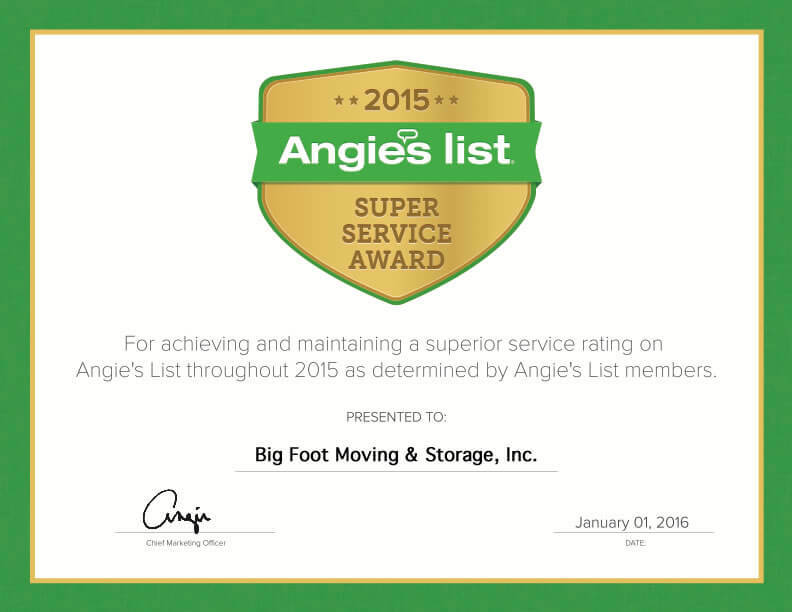 Big Foot Moving & Storage, Inc. has earned the service industry’s coveted Angie’s List Super Service Award, reflecting an exemplary year of service provided to members of the local services marketplace and consumer review site in 2015. Since 2009, this is Big Foot’s 7th consecutive year of winning the award. 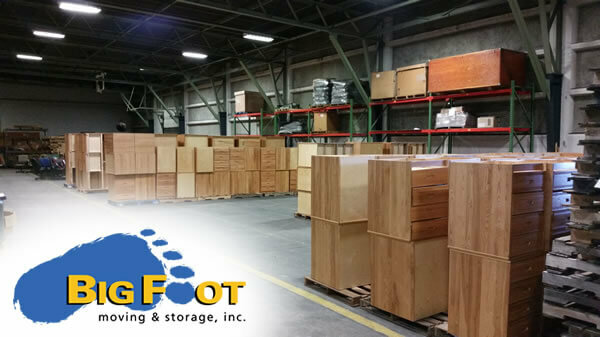 Big Foot Moving & Storage, Inc. is a full service moving and storage company based in metro Boston, providing local and long distance services for residential, commercial, and government customers. Since its inception in 2001, Big Foot Moving & Storage, Inc. has garnered many awards for exceptional service including American Moving & Storage Association’s Enterprise Award for Independent Movers 2014, Angie’s List Super Service Award 2009 through 2015, Cambridge Chamber of Commerce Small Business of the Year Award 2009, and Arlington Chamber of Commerce People’s Choice Award 2010. The company maintains an A+ rating on the Better Business Bureau with tremendous feedback from its customers. 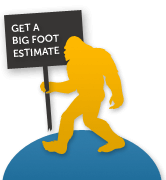 Big Foot Moving & Storage, Inc. is fully licensed and insured as well as a GSA Contract Holder (# GS-33F-035AA) for Schedule 48. In addition to local and long distance moving, Big Foot Moving & Storage, Inc. offers packing and unpacking services, short and long term storage, box pick-up and delivery, employee relocations, move management, antique receivership, and kitchen cabinet distribution. For more information, please call 781-488-3090 or visit http://www.bigfootmoving.com. Pie In The Sky 2015! This is my seventh year participating in this fundraiser as part of the Pie It Forward team — the number 1 pie selling team in 2011, 2012 and 2013. In 2014, my team sold 1501 pies! Thanks to many of you, I was one of the top 5 sellers last year. Please consider purchasing a Thanksgiving pie ($28) in support of Community Servings. You can visit my personal donation page for more information and to place an order. Big Foot Moving & Storage, Inc. loaded (7) 53’ tractor trailers worth of dorm furniture from the U.S. Naval War College in Newport, RI and delivered it all flawlessly to the Westover Job Corps Center in Chicopee, MA last week. The transfer process, organized by the Defense Reutilization and Marketing Office (DRMO) and the Fleet Logistics Center Norfolk-Newport Detachment, started September 21, 2015 and was complete by October 8, 2015. The “old gym” at Westover Job Corps Center received 74 wood desks with carrel and office chair, 50 rolling chairs, 320 Captain’s beds with under storage drawers, and 150 nightstands, with a combined value of $87,600. Additional Job Corps Centers across New England and the Mid-Atlantic are scheduled to be receiving more excess furniture by Big Foot by years end. The Job Corps program provides career technical training and education programs for young people who are at least age 16 that qualify as low income. Students reside in dormitory facilities. ous basis, Big Foot donates office supplies, furniture, and household goods to local schools, non-profit groups, and others in need in the area. Furthermore, it donates labor, trucking, and storage to local community groups such the Zonta Club, The Children’s Room, Arlington Youth Baseball & Softball Association, and Arthritis Foundation. 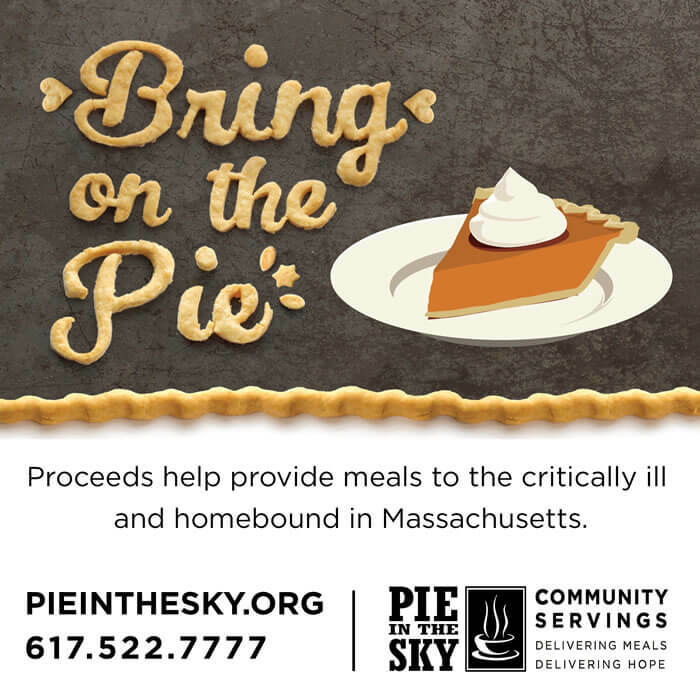 Thanks to generous support of family, friends and clients, Team PIE IT FORWARD sold 1,501 pies and raised over $42k for the 22nd Annual “Pie in the Sky” Thanksgiving bake sale held by Community Servings. Overall, 2014 proved to be another record-breaking year with over 19,000 pies sold by hundreds of volunteers raising $725,000. Team PIE IT FORWARD members are: Mike Bavuso, Tamela Roche, Karen Coleman, Joseph Aceto, Ellen Grubert, Janis Lippman, Josh Muncey, Brian Jurgens, Rich McKee, Maria Montes, Juan & Stella Murray, Kathy Wentworth, Ryan Wig, Patrick Dwyer, Adam Goncalves and Belinda Wasser. Team PIE IT FORWARD helped to box pies at Pie Central and delivered hundreds of pies to customers including ARIAD Pharmaceuticals Inc., Cambridge Offset Prinng, Patriot Financial Group, UBS Financial Services, Crestwood Advisors, RICOH Americas Corporaon, The Appraisers Group, Advance Auto Center, Sirois Electric and William Gallagher Associates. Thanks to Mike Bavuso, President of Big Foot Moving & Storage, Inc. for donating his crew and moving services as our “Official Pie Mover”. About Community Servings Since 1990, Community Servings is a free, home-delivery meals program for the acutely ill, their families and their caregivers throughout the Commonwealth of Massachusetts who are baling 35 types of illnesses including HIV/ AIDS, Cancer, Lupus, MS and Diabetes. The founding goals of Community Servings are to help clients maintain their health and dignity, provide nutritionally and culturally appropriate meals, preserve the integrity of their family … and send the message that someone cares. 93 cents of every $1 raised goes directly to providing healthy meals. Community Servings is a 501(c)(3) non-profit awarded the coveted four-star rang for their efficient and effective business model providing nutrition services to the critically ill by Charity Navigator, America’s premier independent charity evaluator. 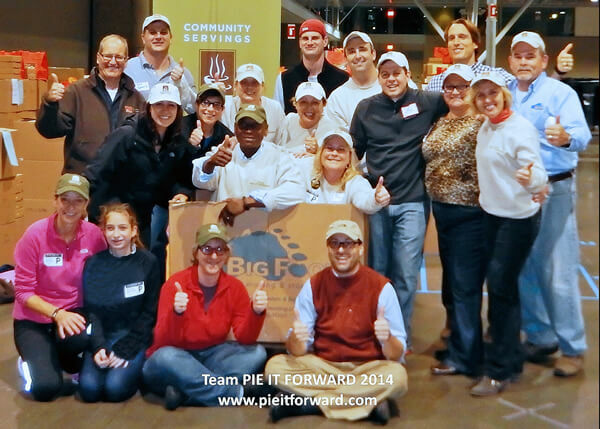 Click here to download more information about team PIE IT FORWARD. This is my sixth year participating in this fundraiser as part of the Pie It Forward team — the number 1 pie selling team in 2011, 2012 and 2013. Thanks to many of you, I was one of the top 5 sellers last year.